160cm H x 32cm W x 32cm D. This may not be suitable as a gift. Assembly Required No. Double insulated class. Bulb Base G9/Bi-pin. Antique Brass Base Finish. Base Height - Top to Bottom. Central London – E1 E2 E14 N1 N5 N7 NW 1-8 SE1 11 16-17 SW1-13 18. QUALITY BRAND**CHEAPEST PRICE ONLINE**FAST DESPATCH This decorative mother and child floor lamp features two different points of light which makes ideal for not only a great source of additional lighting, but also a great reading lamp which makes it a ideal addition to any living room or hallway as well as for a great bedside reading lamp Product Type: Floor Lamps Number of Bulbs: 2 (Included) Colours: Polished Chrome Height: 184cm Diameter (cm): 29cm Material: Chrome Product Weight: 6.21kg Light Source: Halogen Dimmable: Yes Technical Information Requires: 1 x 230 Watt R7 1 x 28 Watt G9 Halogen - Bulbs Included Please note: Images are for illustration purposes only. Due to the nature of this product, when purchasing multiples of this item please note there may be slight. Without bulb. suitable for reflector lamp R80, E27, Max 1 x 60.00 W, 230 V or lamp A60, E27, Max 1 x 40.00 W, 230 V or TCG-SE, E27, Max 1 x 20.00 W, 230 V or LED. ESL = energy saving lamp. Stil Modern. QUALITY BRAND**CHEAPEST PRICE ONLINE**FAST DESPATCH This modern mother and child floor lamp features two light sources which makes this an ideal lamp for additional lighting, but also a great reading lamp which makes it a ideal addition to any living room or hallway as well as for a great bedside reading lamp Product Type: Floor Lamps Number of Bulbs: 2 (Included) Colours: Titanium Light Bulb Type: R7 Halogen Height: 184cm Diameter (cm): 29cm Material: Titanium Light Source: Halogen Dimmable: Yes Technical Information Requires: 1 x 230 Watt R7 1 x 28 Watt G9 Halogen - Bulbs Included Please note: Images are for illustration purposes only. Your order will be delivered by Royal Mail, unless the item(s) exceeds the size and weight restrictions. Larger, heavier items . Opened for testing Damaged box little dent shade This modern silver floor lamp looks great in the home. The father and daughter design has adjustable spotlight heads, making it ideal for reading or close work. Height 181cm. Diameter 44cm. Diameter of base 23cm. Diameter of shade 25cm. Adjustable heads. In-line switch. No wiring required. Weight 4.6kg. RRP £289 only 1 remaining. Standing Lamp. Comes with a pack of three bulbs as listed. Used but perfect brand new condition. Comes with the plug to turn the product on. DO NOT COME WITH THE BUBLS PLACED INSIDE THE LAMP. BUYER MUST PLACE INSIDE THEMSELVES. BATHROOM LIGHTING. Product Info: A tall 2 light floor lamp with a double stand supporting an uplighter as well as an adjustable branch holding a reading lamp. Other colour options available. INDOOR LIGHTING. 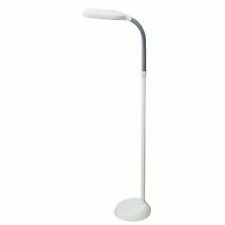 Product Information: A tall 2 light floor lamp with a double stand supporting an uplighter as well as an adjustable branch holding a reading lamp. Other colour options available. Bathroom Lighting. Finish Opal Glass, Antique Brass. This Modern Single Floor Lamp from the 'Hackney' range by Endon Lighting looks great and is ideal wherever a modern look is desired. The Floor Lamp is Double Insulated. The 'Hackney' range consists of matching a Single Table Lamp. Manufacturer: Wofi lighting. Spotlight spots. LED lights. indoor lighting. Thus, each room gets a touch of exclusivity! This lamp is also continuously adjustable in height and the halogen bulbs are included.